Add a Healthy Fruit Slushie Frozen Drink Machine to Your School Lunchroom! 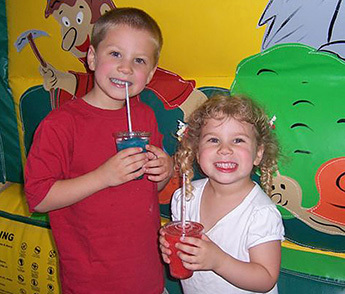 Our 100% Fruit Filled Slushies are a huge hit with kids. 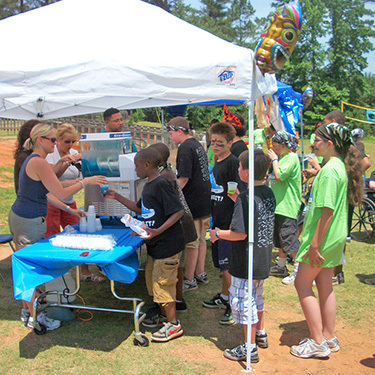 Birthday Parties, Team Events, Clubs and Summer Camps all are great places for one of our Slushie Machines. We have several slushie machines in schools across the Greater Atlanta area. Our drinks do qualify as a "Smart Snack" healthy drink for children in school as defined by the UDSA. We can get creative with speciality drinks for children too. Names like Rocket Fuel, Steven's Slushie, Tracey's Tropical Twister bring a fun spin to the party. There are also Smoothie style mixes and even some soda flavored frozen drinks to choose from. We even have Kosher mixes and machines ready for your Bar or Bat Mitzvah. Delivery, Set-Up, Drink Mixes and Pick-Up are always included. Call us early at 404-352-9996 to reserve your date and decide on your flavors.